We’ve taken a quick look at how the earliest motorcyclists dealt with rotten roads (which was one of the reasons for the establishment of clubs), how the children, who later grew up to become the original, charter members were exposed to the earliest motorcyclists in our area and then why clubs formed and a bit of history on the major clubs in the area before and during the creation of the JRMC. All this build up was to show that our club formed up in as a part of historic and social trends in the greater world of overall club and motorcycling life in the Puget Sound area. We are now going to do some slicing and dicing with a mental tool, an analytical knife to get at the details as best we can. This knife will allow me to be a kind of historical “chef” serving up meals of various information so we can learn, together, what was going on. (I’m only slightly ahead of my club brothers and sisters in this quest for information). The first step in preparing this meal is to look over the ingredients – so I’m going to explain the sources of information. Before we tell the story of the details we need to be sure there is credibility in where the information is coming from. If we don’t it’s all myth making. The sources of information come in several ways. 1). Oral history – The memories of the remaining founders and early members of the club. So far these include, Lila Bulen and Jean Stockinger, who are still alive. There may be others and if I discover them I’ll include them. We’ll do the same in the future with others like Carmen Tom, Ed Marshall for the 1950s and Fred Bare, Great Seymour, Benny Legend, Harley Charlie and others for the 1960s when it is time. Oral history is great. The only problem is that memory can trick people. Someone in their 90s trying to remember things from 70 years ago can be a challenge. Heck, I’m coming up on retirement age and I can hardly remember what I did yesterday so it is a stretch to expect one of our seniors to regurgitate decades old facts with absolute certainty. However there are some things that really stick out and those are safe bets because the memories are so strong. 2). Photographic collections – photos are strong memory inducements and come with different levels of information. Some photo collections come with detailed descriptions written on the backs of the photos or underneath them in the original albums they are included in. These sources of information are extremely valuable especially for names of riders, locations of events and dates. Other photo collections come with no additional information. However even if there is no additional written information in a photo a person working with them can still find clues about things. For example a peculiar paint job in one collection with no written information may show up in other collections with written information. I’ve learned that you can do forensic analysis on photos by noting the painted designs on helmets, they way fenders have been bobbed and even what riders wear. You can establish which club racers belonged to because they would wear club regalia – The Tacoma Ducks often wore sweaters with their logo on the chest and the Seattle Cossacks had their logo applied to the gas tanks and front forks of their bikes. Another thing is the clothes the riders wore. Club folks wore different helmets such as pudding basins, football, leather aircraft covers, peaked caps (cop styled hats), golf hats and cowboy hats. 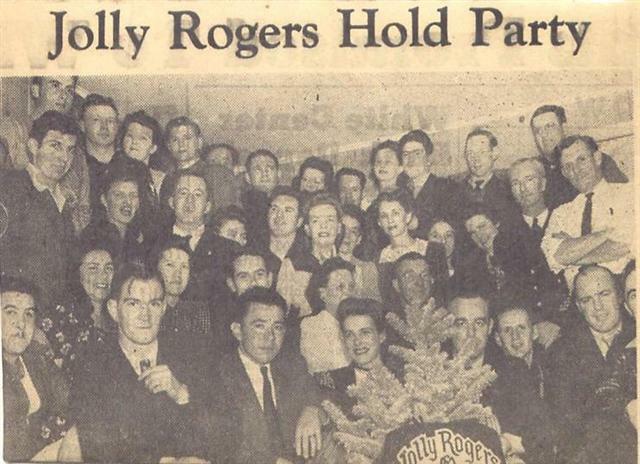 For example, founder Woody Combs can be spotted in early photos because he wore his cowboy hat with his Jolly Rogers Motorcycle Club jersey. The entire issue of clothing is fascinating, and we’ll look at it as a separate blog in future, because you can see our club evolving as the years pass: prewar militaristic garb such as the flying covers and jodpurs (those bulging old-school cavalry pants), club jerseys and neat jackets worn from 41 to 46 or so gradually gave way to the peaked caps and rolled up jeans and black shirts with club back patches around 1948 to our modern “biker” look; a combination of the old 50s influences combined with a heavy dose of the outlaw biker look. Photos are our main course in historical analysis and, so far, we have four collections to work with for the earliest years and a bunch of other collections for later years. The Rhotan Collection – currently posted on our web site and created by founding members Burt and Helen Rhotan. and one of the finest there is. While it is specific to Lisa’s father “Little Peppy” it has many photos of events at the Jolly Rogers Motorcycle Club track and hill as well as photos of our members racing and hillclimbing at other tracks. Check it out for a delightful visit to our motorcycling past. The Truttman Collection – Provided by Rudy Truttman of California last year. It is a collection of photos taken by his Dad, founding member Earl Truttman of the earliest years of the club before the family relocated to California. Rudy has been the source of the earliest illustration of our Pirate as well as the earliest known roster of founding members. Several of this collection’s photos are duplicates to the Rhotan collection showing that negatives were shared among early members and some of the photos have never been seen before. The Stockinger collection – The most recent discovery from founders Paul and Jean Stockinger which are in process of being provided to our club. Steve Stockinger, life-long motorcyclist and first cousin of Rudy Truttman has started to scan an incredible collection of photos organized into an album by his mother years ago. This collection is one of the finest and largest yet discovered. Like the Peppin collection it has detailed notes on names of riders, locations, years and even nicknames of motorcycles. While I only have a small part of the collection available, Steve and I are working together to make the entire collection available. These four collections are going to be the foundation of our look at the 1940s and the early 50s. 3). Official documents – These are our final source of information and consist of newspaper microfilm – Photos and articles on file at Seattle and Tacoma’s central libraries about the club; old Club documents such as brochures, club pins, posters, applications, bylaws and such. This is a dryer and rather rare source of information cause most of our club stuff is lost or hoarded away by collectors and the newspaper stuff is a great deal of work to find. I’ve spent many hours getting sea-sick looking at rolls of newspaper microfilm for the occasional picture or article about our club. In my most recent visit I looked at dates for two dozen known events and found only 5 items – 2 grainy photos of hill climbs with information and 3 articles. While newspapers and other written information is rare and a lot of work to find it has one great advantage as it positively, absolutely dates an event which allows us to be unquestionably sure when we say something happened at a certain time. This is good because once in a while notes in photo albums contradict each other. One collection might say an event happened in 1945 and another in 1946 but if we find a newspaper article with a date of 1945 we know which photo album has the correct date. Also, I’ve found that newspaper articles from back then occasionally mention rules for field games and other details long lost to the memories of our surviving founders. 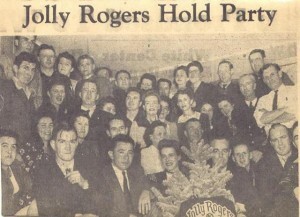 There might be others and most, if not all, are in the well-known Christmas Party photo of December 8, 1945. This entry was written by fingers, posted on February 15, 2009 at 9:18 am, filed under History. Bookmark the permalink. Follow any comments here with the RSS feed for this post. Post a comment or leave a trackback: Trackback URL.